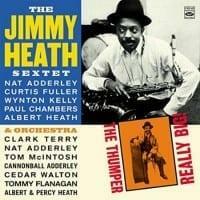 View Cart “The Jimmy Heath Sextet – The Thumper / Really Big!” has been added to your cart. 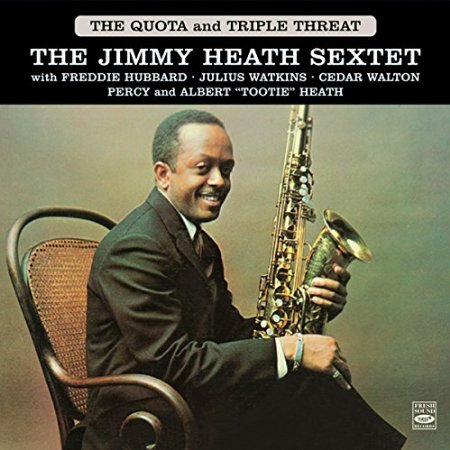 These two albums, “The Quota” and “Triple Threat” by the Jimmy Heath sextet, present the Philadelphia brothers-in-arms in a series of particularly impressive blowing sessions, thanks not only to the quality of the soloists, but also to the framework created by Heath’s fine arrangements. There is a crisp, clean ensemble blend throughout, and Heath’s loose, flowing scoring bring a sense of order for the wealth of good-to-excellent solo work. The three horns deliver admirably on both albums. Jimmy with his strong, tough-playing tenor, is imaginative and swinging; and Julius Watkins and Freddie Hubbard, both top-rank men, are consistently interesting and entertaining. Watkins is a very effective performer, contributing notably in the ensemble, and Hubbard, especially, demonstrates deftly why he walked away with the 1961 critics poll citation as new-star trumpeter. Finally, Walton, Percy and Albert Heath are everything one could wish for in an assured and powerful rhythm section. Freddie Hubbard, trumpet; Julius Watkins, French horn; Jimmy Heath, tenor sax; Cedar Walton, piano; Percy Heath, bass; and Albert 'Tootie' Heath, drums. 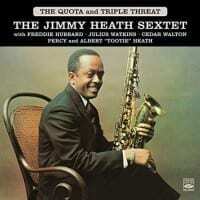 "Jimmy Heath's considerable talents are very evident on this fine hard bop title. His supple, Dexter Gordon-inspired tenor work shines throughout the album's seven tracks, which range from the challenging yet fleet originals "Funny Time" and "The Quota" to attractive covers like "When Sunny Gets Blue" and Milt Jackson's "Bells and Horns." Heath also mixes it up stylistically with elements of both East Coast jazz (Philly native, vigorous ensemble work) and West Coast jazz (spry, vaporous arrangements), showing his flexibility amidst the music's healthy, bi-coastal rivalry of the late-'50s and early-'60s California stars Art Pepper and Chet Baker would cover several Heath numbers on their excellent 1956 collaboration Playboys. The Quota also benefits from stellar solo contributions by trumpeter Freddie Hubbard, French horn player Julius Watkins, and pianist Cedar Walton; brothers Percy and Albert Heath handle the bass and drums chores admirably, and they make a family reunion of it. The Quota's strong material, tight arrangements, and thoughtful solos help make this Heath title one of the better hard bop releases available and a must for any jazz collection." "Jimmy Heath has long been at least a triple threat as a musician (tenor, flute and soprano), arranger and composer. On this CD reissue, Heath sticks to tenor, performing "Make Someone Happy" and "The More I See You' while joined by pianist Cedar Walton and his two brothers, bassist Percy Heath and drummer Albert "Tootie" Heath. The other five numbers consist of four of his originals (best-known is "Gemini") plus a reworking of the ballad "Goodbye." For these selections, the quartet is augmented by young trumpeter Freddie Hubbard (who takes a few fiery solos) and Julius Watkins on French horn. The arrangements of Heath uplift the straightahead music and make each selection seem a bit special." The Thumper / Really Big!